Swaziland is being ruled by King Mswati III since 1986. He has been ruling the country by the 1973 decree which was proclaimed by his father King Sobhuza II banning political parties. Political parties are not allowed to participate in elections and there is no freedom of expression, assembly and association. As political activists, we are calling on King Mswati III to allow political parties to participate in elections and have freedom of expression without being intimidated by the 1973 decree. The is no freedom of expression in Swaziland. The media is controlled by the government, as quoted in the Amnesty International Report of 2014/15 on Swaziland. There is only one magazine - The Nation - which is privately owned. The Nation is Swaziland's last independent publication, analysing politics and social development in the country. It's editor Bheki Makhubu was arrested in 2014 and is currently serving a two year sentence for contempt of court after a grossly unfair trial. Women in Swaziland have no rights. Women are treated as second class citizens. Violence against women and girls is a problem, putting them at risk of HIV. The Swaziland Constitution of 2005 says, women have a status of minors and are being restricted access to government and economic entitlements. Women can not get loans from the banks and land from the chief without a husband or a son who is of age. As a political activist I am calling on the government of Swaziland to respect human rights. Political parties, human rights activists and trade unions face harassment, beatings, arrest, unfair trials on political charges, ill-treatment and torture. The responsible people are not brought to justice. The government is using the 2008 Suppression of Terrorism Act and the 1938 Sedition and Subversive Activities Act to intimidate political activities. They restrict human rights such as freedom of speech and association. The president of PUDEMO - Mario Masuku - and activist student Maxwell Dlamini were arrested at workers day rally on May 2014, charged with terrorism and sedition for chanting a slogan and singing a song. Human rights lawyer Thulani Maseko and was imprisoned for two years in July 2014 for contempt of court after a grossly unfair trial merely for exercising peacefully his right to freedom of expression. Amnesty International, Amnesty International Report 2014/15: The State of the World's Human Rights, 25 February 2015, Index Number: POL 10/0001/2015, Pages 349-350; https://www.amnesty.org/en/documents/pol10/0001/2015/en/ Date Accessed: 01-06-2015. Mario Masuku, a political activist and leader of the People’s Democratic Movement (PUDEMO) incarcerated on the 15th of November 2008 for shouting ‘Viva PUDEMO’, under the Suppression of Terrorism Act 2008 and later discharged by the high court on September 21, 2009 after spending 340 days in prison has suffered gross injustice at the hands of the Swazi regime to say the least. To add salt to the injury, Masuku was again arrested on the 1st May 2014 after making a speech expressing his constitutional right to freedom of speech at a Mayday rally and was charged with terrorism and sedition along with Maxwell Dlamini. During his imprisonment, Masuku, has been informed of the deaths of three of his relatives including his mother, he was also informed of the demise of two of his brothers which he has been denied the right to bury because he is imprisoned. During his imprisonment, Masuku, has also been denied access to any form of medical attention by King Mswati III through his government just for fighting for his freedom and for the Swazi people. King Mswati III is the last remaining absolute monarchy in the world and I feel strongly that the treatment of political activists in Swaziland is wrong and their basic human rights are being denied. The Congress of South African Trade Unions and most recently the European Parliament through an overwhelming majority resolution on the 21st May 2015 have demanded for the unconditional release of comrade Mario Masuku, Thulane Maseko, Bheki Makhubu and all other political prisoners. 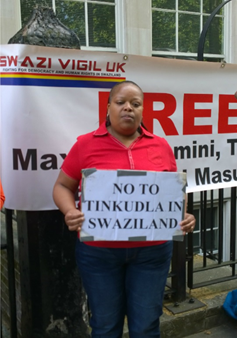 My reason for joining the Swazi Vigil group of political activists, was because it is my honest belief that what is happening to the people Swaziland is undoubtedly inhumane and undemocratic more so the imprisonment of Mario Masuku is unlawful and unconstitutional. As a member of Swazi Vigil, I believe that we as Swazis within Swaziland and outside of its borders deserve to be heard and recognised. 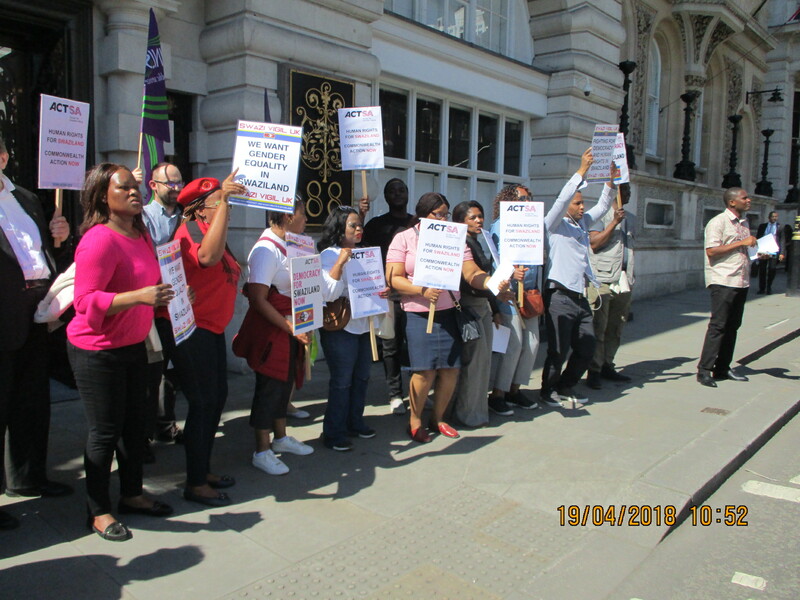 It is my duty and intention to continue attending political demonstrations outside the Swazi embassy in London until Swaziland gains full multi party democracy which is our objective as Swazi political activists. Human-rights problems in Swaziland include “extrajudicial killings by security forces; mob killings; police use of torture, beatings, and excessive force on detainees; police impunity; arbitrary arrests and lengthy pre-trial detention; arbitrary interference with privacy and home; restrictions on freedoms of speech and press and harassment of journalists; restrictions on freedoms of assembly, association, and movement; prohibitions on political activity and harassment of political activists; discrimination and violence against women; child abuse; trafficking in persons; societal discrimination against members of the lesbian, gay, bisexual, and transgender (LGBT) community; discrimination against mixed-race and white citizens; harassment of labour leaders; restrictions on worker rights; and child labour. The Kingdom of Swaziland has the distinction of being sub-Saharan Africa's last remaining absolute monarchy. Though it is classed as a lower income country, income distribution is skewed, with nearly eighty percent of its 1.2 million people living in absolute poverty. Years of government corruption, excessive spending by the royal family and a drop in revenue from the South African Customs Union has left Swaziland in a deep economic crisis. The crisis has resulted in a forty percent unemployment rate and massive reductions in public services such as education and health care. Increased financial woes resulted in further reductions in Swaziland's flailing health care sector. The country suffers the highest HIV prevalence rate in the world at twenty-six percent but has failed to secure adequate treatment for its citizens due to shortages in antiretroviral drugs and HIV testing. According to the World Health Organization, life expectancy in Swaziland is 48 years of age. 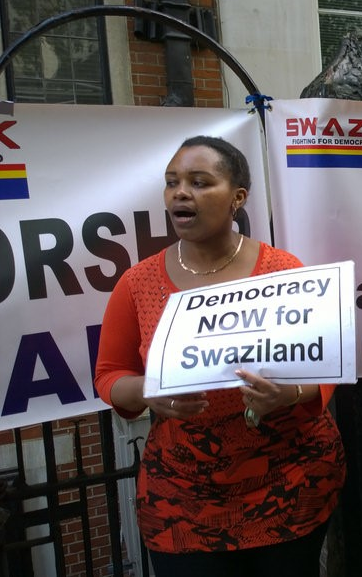 Swaziland endures a political crisis, as well. King Mswati III retains absolute control over the executive, legislature and is immune from civil suits and criminal prosecution under Swazi law. Political parties are banned from participation in elections and many pro-democracy organizations have been deemed terrorist entities by draconian counter-terror legislation. Freedom of press is also severely restricted as many journalists practice self-censorship in fear of retribution from the government. Amnesty International is concerned with ongoing violations of the rights to freedom of assembly, freedom of association and freedom of expression by the government of Swaziland. Pro democracy leaders and activists suffer arrest, torture, beatings, pro-longed detention and forced searches of their homes and offices. Peaceful protests and anti-government demonstrations are often met with violent dispersal by security forces. Civil society organizations, trade unions and the media undergo increased harassment and surveillance. The credibility of Swaziland's September 2013 elections was questioned by the African Union Election Observer Mission due to the prohibition of political parties. The African Union called on the government of Swaziland to implement the African Commission on Human and People's Rights 2012 Resolution on Swaziland. Among other objectives, the resolution urges Swaziland to ensure and protect the human rights to freedom of expression, freedom of association and freedom of assembly. VIVA SWAZI VIGIL – PHAMBILI! 2015 Amnesty International USA 5 Penn Plaza, New York, NY 10001 SWAZILAND HUMAN RIGHTS.